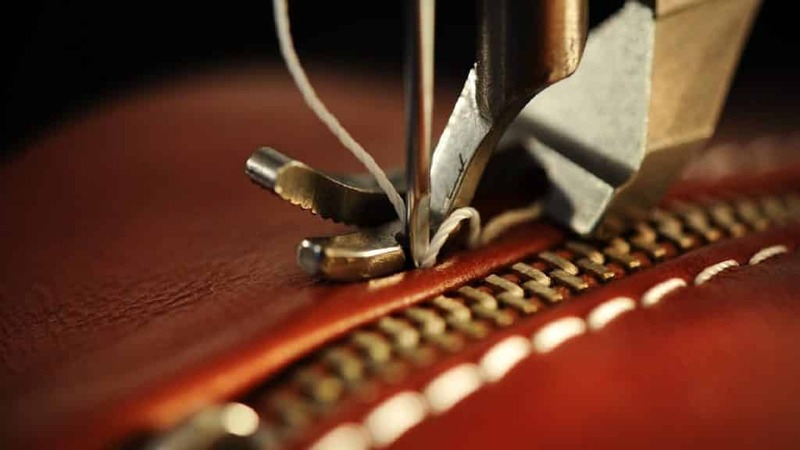 If you have tried to stitch genuine leather material at home with a sewing machine, you may have noticed that it is not an easy task. Regardless of the type of leather material in use, you would need to have a good deal of experience in sewing before you attempt to go for leather projects. Most leather sewing projects involve three types of leather material; genuine leather, suede or faux leather. Sewing with either of them requires skill and a degree of understanding of your sewing machine’s capability. You also need to have specialized sewing equipment including accessories and the right sewing components for working with leather. To work on genuine leather, suede or faux leather projects, you also need to familiarize yourself on how to use specialized leather sewing needles. Leather projects also require different presser feet that feed the material to the machine smoothly without causing folds. Most sewing machines are not designed to work with leather. Your sewing machine’s manual can be used to identify if it is capable of working with leather. If it does not specifically provide instructions on how to work with leather or how to set up the machine for leather stitching, then chances are that it is not meant for leather. Being aware of your sewing machine’s capability will help you to avoid causing damage to it. Leather and other heavy materials are best suited for stitching on industrial level sewing machines. These machines usually have a long and heavy needle and specialized feeding dogs that keep leather from curling or folding up. Leather is an amazing yet difficult material to work with. Both thick and soft, it comes in different levels of hardness and colors. You will find working on leather projects to be a very different sewing experience than working on cotton or polyester fabric. Leather offers more resistance as you will find that your machine needle requires greater strength for penetrating through it. It is also stickier than cotton and tends to stick to the presser foot when passing through your machine’s feed dogs. It is important that you use the correct type of sewing machine needles for leather. If the leather does not pass through the sewing machine correctly, you can end up with holes in your fabric that are much more visible than holes in other kinds of materials. Depending on your project needs, different styles of sewing applications would need specific sewing machine needles and presser feet. Unlike other kinds of fabric, leather is usually measured in ounces. The thickness of the material is assessed through an ounce-to-size measurement. For instance, a piece of leather that is 4 oz in weight could be 1/16 inches thick, whereas a different 8 oz piece of leather might be 1/8″ thick, and so on. The heavier the material is, the thicker the leather you will find. You’ll find this to be true if the total size is kept the same. The leather that is generally used in upholstery is usually not heavier than 12 oz. This is the case because it is very difficult to try and sew heavy, thick leather pieces together on a home machine. Leather is also not a highly elastic or stretchy material. This means you cannot use certain types of stitching styles and needles with leather. The sewing machine needles for leather come in different varieties of functional styles. Getting the right leather stitching needle for your project is important if you want to get the best results from your sewing machine. For instance, the very thin 8/60needle is used for delicate stitching or embroidery. If you tried to use it for leather projects, you will find it incapable of punching through leather at all. The leather needles are slightly longer and thicker than the regular machine needles. The tip is shaped like a wedge, pointed near the tip. This makes the needle ideal for sewing leather as it can penetrate the material easily and come out with the thread packed tightly in place. The leather needle can be used easily on genuine leather, suede, vinyl, heavy faux suede, and even works with thick, non-woven fabric. Many popular brands, including Singer and Brother, support leather stitching at home through their dedicated line of sewing machines. You should be very careful when working with leather. Unlike other materials, any needle holes made into leather are permanent and quite visible. Given that leather needles are quite thick to allow a sturdy thread inside, the pin-holes can be visible even from a distance. The best way to reduce the chance of a mishap is to practice the stitch on a test fabric before continuing with leather. You should also avoid running a backstitch on the material to keep it from getting torn up. The different sized needles are suitable for the following. The right size and width of leather sewing machine needle are essential for creating a high-quality stitch. The old saying that you get what you pay for is completely true with sewing machine needles. You can find a box of leather sewing machine needles priced as low as $6 and a box as high as $20 on the Amazon store. While the latter is more expensive, it comes from a more reputable brand and you can be certain that your needle will not break unexpectedly while being used on a single project. We cover needles from four of the most popular sewing machine needle brands here. 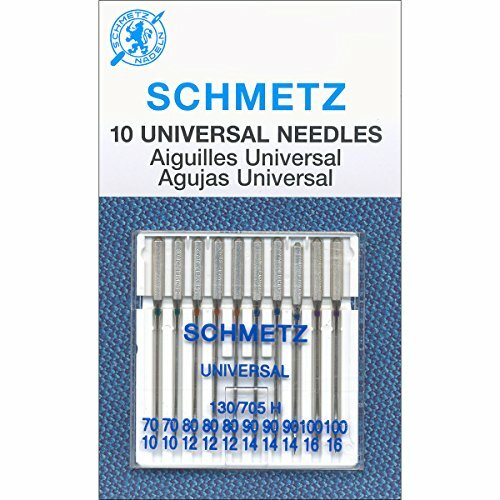 We feel that when it comes to sewing machine needles, Schmetz offers the biggest range of leather needles in the market. Schmetz also offers the best value for money on their bulk quantity packs. Schmetz started its operations in 1851. It is a family-owned company where the majority shares are still held within a single family. Schmetz needles for sewing machines are made for the highest standard and offer significantly better performance in all types of application. Their durability and high-quality is particularly important in leather applications. 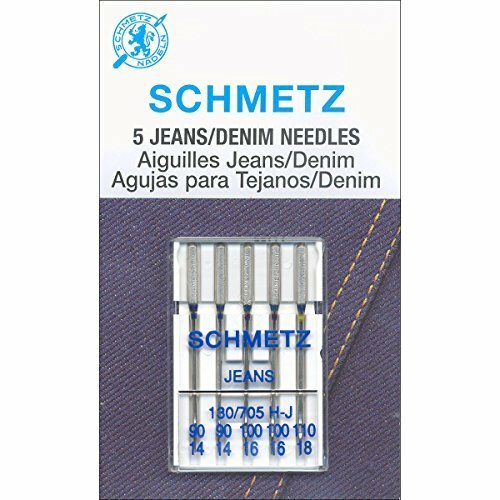 The Schmetz Jeans & Denim needles 18/110 – 5/PKG are perfect for sewing light leather products, denim, and jeans. It can do an effective job on various Singer, Brother, and Janome models. The needles are durable and stay sharp for quite some time. These needles are great for making baskets wrapped with fabric. The needles are most suitable for synthetic leather, vinyl, and waxed cloth. The needles last for a very long time. Perfect for working on various types of projects. Some users have complained that they could not fit it in their machine. The Euro-Notions universal machine needles have a slightly curved needle tip that makes them ideal for different types of fabrics. The needles included in this product are high-quality and very durable. 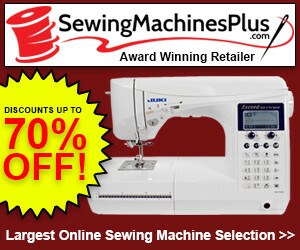 They can be easily attached to a variety of sewing machines and beginner friendly. The needles also come in a compact little box that is small enough to fit in the storage compartment of a sewing machine without trouble. It features include the following. Can be used for both woven and knitted fabric. Great for leather and other heavy material projects. Suitable for a household leather sewing machine. A great brand and company behind the product. Comes in a cute little box. Fit for many machine brands. Some customers have complained that it is fragile and prone to breaking on heavy use. The Singer Titanium Machine Needles (18/110) are perfect for sewing different types of leather materials. These needles are made with a stainless steel alloy that is built for durability and strength. 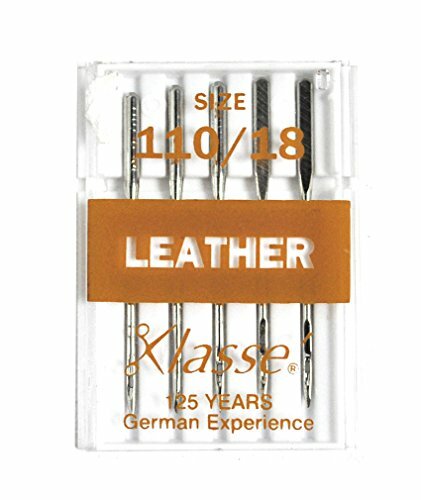 Lasting five times longer than other needles for leather, they prevent heat and friction from affecting the thread which minimizes the breakage. Since the needles carry the Singer name, the company has made sure that it can easily fit with all their supported models that are used for heavy-duty use. 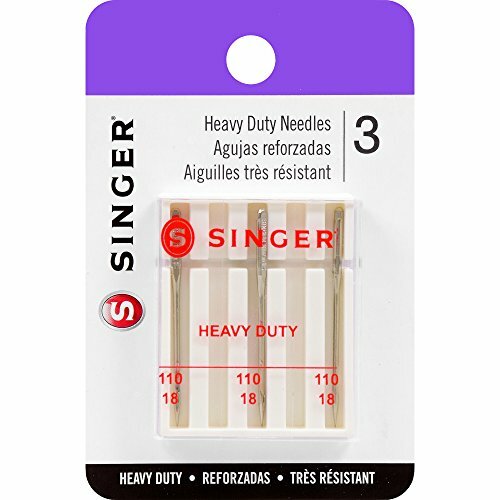 These needles from Singer are color-coded, making it easier to identify them. The product package comes in variable needle sizes. If you are looking to use the needles for leather projects, make sure to get the item with 18/110 and 19/120 sewing machine needles. Very durable and long-lasting compared to regular sewing machine needles. These are some of the best needles for thick fabrics and can be used on denim jeans and jackets or genuine leather jackets. Suitable for and easily fits in all Singer models. They may not work on Brother, Janome or Juki sewing machines. Klasse is another popular name in sewing needles industry. The company started during the early 1980s and has built a reputation as a high-quality needle manufacturer for all kinds of sewing machines. The company introduced several new features including color-coded needles, new needle styles, and marketing methods. Most needles break because the stress is not evenly spread across the length of the needle and friction causes the needle to break during stitching. Klasse’ needles are designed with a special style of groove that makes them last longer by distributing the tension equally from the tip to the shank. This sewing machine needle is intended for genuine leather stitching. Its unique curved design at the clearance above the eye (CAE) is meant to distribute the pressure equally throughout the needle while stitching making the Klasse needles last much stronger than other conventional needles. These needles can be used in a large variety of sewing machines including ones that work at a very quick speed. The needles are low cost and easy to attach. Ideal for intermediate users who regularly work on small leather projects. Strong needles that last longer even on thick fabric such as leather. The needles do not perform well on lighter fabric and can tear it up.